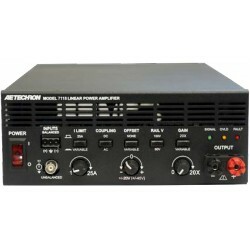 Linear Power Amplifier There are 3 products. Stable when driving highly capacitive loads. User-selectable controlled-voltage or controlled-current modes of operation. 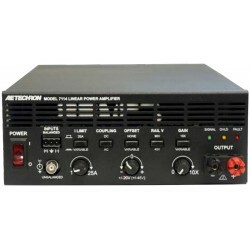 System output of over 3,600 watts or over 200 amperes maximum is possible with multiple, interconnected amplifiers. Efficient design and light-weight chassis materials allow amplifier to occupy only 2U height and weighs only 41 lbs. Protection circuitry protects the amplifier from input overloads, improper output connection (including shorted and improper loads), overtemperature, over-current, and supply voltages that are too high or low. Shipped ready to operate from 120-volt (±10%) single-phase AC mains; 220/240-volt model available on request. User-variable DC offset: ±20V or ±45V. User-adjustable current limit: 1A to 25A.